Diwali is a Hindu festival known as the festival of lights which is celebrated with sweets such as laddoo, barfi and halwa; which can in turn affect blood glucose levels. Diwali is the most popular of all the festivals from South Asia and is particularly popular with children because of the lights, fireworks and sweets involved. The celebratory food can provide challenges for blood glucose control so it pays to plan how to manage carbohydrate intake through the celebrations and to test blood glucose levels at regular intervals. 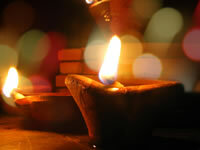 Diwali is a 5 day festival that starts on the 13th lunar day of the dark fortnight of the Hindu month of Ashwin. Diwali is often celebrated with fireworks. Candles and elaborate lamps decorate houses and streets. Women will commonly wear brightly coloured clothing and jewellery, and henna tattoos may also be worn. Gifts are exchanged on Diwali and traditionally it is sweet food that is exchanged. Halving or even taking quarter sized portions of sweet foods will allow you to enjoy a greater variety of sweets. Keep a count of what you’re having as it can be all too easy to lose track. If you make your own sweets, you have much better control of how much sugar, carbohydrate and calories will be in the food. If you need to watch your calorie intake, use less oil for any fried foods and use more healthy oils such as olive and avocado oil. Non-starchy vegetables are arguably the healthiest foods available to us. They are filling, low calorie and have little impact on blood glucose levels and are full of nutrients. It’s recommended to include non-starchy vegetables within your diet during Diwali. Exercise is useful for helping to control blood sugar levels and dancing can be a fun way of incorporating exercising into Diwali. If you’re not so much of a dancer, find some time in the earlier part of the day to get some exercise, such as jogging, weight training or a brisk walk. If you’re having foods you wouldn’t normally have, it’s important to test your blood glucose levels to see how well they’re responding. If your levels begin to go too high, it’s better to cut down on foods higher in carbohydrate until your sugar levels settle down again. If you take insulin your blood sugar levels can go low as well as high and it’s important to be aware of the symptoms of high and low blood glucose levels. If you feel your levels are either too high or too low, a blood glucose test will be able to confirm and allow you to take appropriate action.